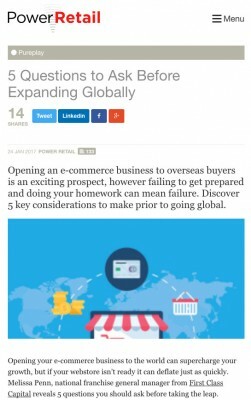 Opening an e-commerce business to overseas buyers is an exciting prospect, however failing to get prepared and doing your homework can mean failure. Discover 5 key considerations to make prior to going global. Opening your e-commerce business to the world can supercharge your growth, but if your webstore isn’t ready it can deflate just as quickly. Melissa Penn, national franchise general manager from First Class Capital reveals 5 questions you should ask before taking the leap. The international marketplace for many Australian online retailers represents the ultimate mix of opportunity, scalability and potential. It’s previously been a move reserved only for large corporations who could afford the massive initial outlays, but rapid improvements in technology have seen it become accessible for all entrepreneurs and small businesses too. Opening an e-commerce store to overseas buyers is an exciting prospect, and the perceived costs involved to get started online are small. However if you’re not well prepared, there could be a number of hidden costs and obstacles down the line. One reason why e-commerce businesses can fail in its global market is they move too soon without assessing risk or employing a strategy different to the one used at its home ground. It’s a completely new environment, and strategies that work in Australia are not necessarily going to thrive cross border. Factors like currency fluctuations, customs issues, foreign laws and cultural trends are important issues to consider early on. Below are 5 key considerations you should make through before expanding your online store globally, to ensure your first time is a successful and profitable one. 1. Do I have a solid foundation? Retail expansion of any type demands an investment of your time and that of your team members, which can have an adverse effect on your existing operations if they’re not already functioning smoothly. If your current model still requires attention, time and money will be stretched between that and your new venture. Before seeking out new markets, make an assessment of your business success at home. Is cash flow positive? Are there any opportunities to add new channels to your existing markets? It is critical that your existing business model is already stable and contains some level of scalability. This means your products sell and customers have validated that your system works, and you have standardised workflows or processes that can easily be replicated in other markets to get results. 2. Which markets will I enter? Many e-commerce businesses initially consider expansion because of an overseas interest in their products. If this is the case it can be a good place to start digging for new market insights. Gather data on foreign market trends for your product, look into e-commerce growth and penetration, and assess online market size and any notable competitors. Cultural and brand fit are particularly important in new markets as some marketing strategies and brand values may not translate as easily in some countries. You also need to consider language and translated marketing content, as well as customer service and communications. For this reason, it’s a good idea to commence expansion in similar markets to Australia first, where barriers such as language and culture will have minimal effect on your trading. 3. How will products be distributed? Global logistics demands careful consideration. Research your options and decide if you’re going to ship internationally or expand to multiple warehouses or fulfilment facilities in different regions. 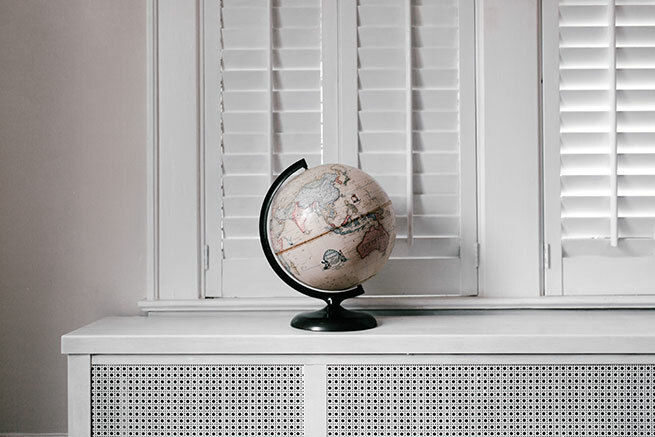 Using overseas shipping is expensive for customers and shipments can go missing frequently with some countries and delivery companies, but setting up an overseas presence on the ground can be costly and can take time to build. You’ll also need to ensure you’re using an e-commerce platform that can handle a large quantity of orders, the overseas shipping, and different currencies. Look into the capabilities of your current software and assess the costs of a transition if you need to purchase something else. 4. What localisation will I need? A cookie-cutter approach to global markets rarely works. Each region is different and your strategy needs to be tailored to each one. Ensure that you have an e-commerce platform to make purchases as simple as others offered locally in the market, consider all of the changes to your online presence that may be required, and assess which marketing tactics, branding and channels will work best with each market. Although some markets appear similar, things like social media habits and purchase technologies are different across the globe and it can have a large effect on the success of your offering. 5. What resources do I need for global expansion? Adding new markets while maintaining your local operations can put a strain on your resources. Be clear on what you are prepared to invest before jumping in. Consider any new staff that may be required, current staff that can be reassigned, physical assets needed, and how to structure your financial investment. Weigh up all of the potential costs for entering each new market and ensure you have a refined strategy to finance and staff them.